It doesn’t matter whether you’re planning on keeping just one pet pig or starting a commercial heard of pigs you have to be registered as a pig keeper with the Defra’s Animal Health and Veterinary Laboratoties Agency (AHVLA). This law exists because in the event of a disease outbreak, it’s imperative that the precise location of all livestock like pigs is known in order to control and eradicate the disease and virus before it spreads. You place both your own and other livestock in the immediate area at risk if you do not register your holding as a pig keeper or report “notifiable diseases”. Even a micro pig is bound by the same laws, so you need to understand the laws around feeding, tagging and moving them from place to place. In this article we’ll look at why you should think about keeping a pig in the first place and what you need to do should you decide to make the leap to looking after livestock. Pigs have probably been around for as long as we have. They have certainly formed part of the staple human diet for thousands of year and there are very good reasons for this. 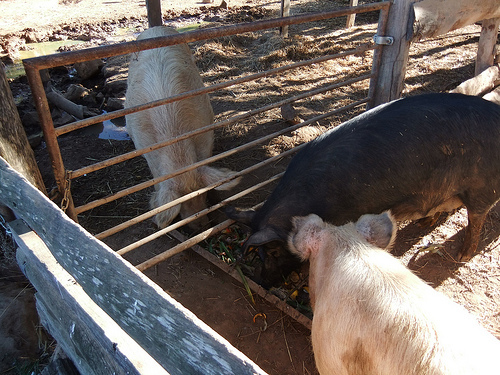 A key reason behind choosing to keep a pig is that basically; they provide good food. “You can eat everything but the oink” is often quoted by Butchers and Farmers and it is true! Pork is a hugely popular meat and traditionally and widely enjoyed pig meat products include the joint for the Sunday lunch, the Christmas ham from the back leg or the neck and of course the ever popular bacon sandwich. Aside from been an excellent food source, pigs are a great starting point for a beginner to learn the ropes of keeping livestock. After some careful planning and preparation, and when treated properly, pigs are relatively trouble-free to rear. There was a time, not so long ago, when many houses kept a pig which they fattened up for Christmas. Pigs are not as big as cows, which are difficult to move and control or as small as sheep, that are too easy to move themselves and too difficult to control. Pigs can be kept in small numbers in quite small areas. Compared to other livestock they are relatively inexpensive and easy to feed. A well looked after pig tends to be a healthy pig, and healthy pigs tend to be robust, disease free and if you do decide to eat it, extremely tasty. In a nutshell pigs are a great animal to keep because they fertilise soil, clear the ground, eat vegetable waste and of course produce lovely quality meat. It’s not as simple as buying a pig and then off you go, you also need to deal with the legislative side and that’s always the best place to start. Of course regulation vary from country to country so it’s always wise to contact your local department of agriculture. If you’re like us and live in England, you need to contact the Rural Payments Agency, which is a subset of Defra. Once you have liased with the RPA you will get a County Parish Holding (CPH) number, this is also called an gricultural holding number. Once you have your CPH number, make sure you contact Animal Health, another subet DeFRA that was formed from the State Veterinary Service and a number of other related organisation. Animal health will provide you with a Pig Herd Number and explain about the relevant movement licences and the various bits of other legislation you need to know about. They will also send you their Pig Welfare Guide. If you are thinking of breeding pigs you also need to provide some protection for sows while they are giving birth to their piglets. Like humans, Pigs need constant access to clean drinking water so one of your first purchased should be a sturdy trough to keep them happy. It’s very important to remember that it now illegal to feed pigs with waste food from your kitchen, including vegetable scraps. If you have any questions about feeding pigs, you should ask your vet, feed supplier, or contact a pig society. More information on pig feed is available in the Department for Environment, Food and Rural Affairs (Defra) booklet on keeping pigs. There are a wide variety of breeds of pig in the UK; many have certain characteristics that could affect your decision. By way of example British Saddlebacks are very tame and Tamworths produce good bacon. There are various magazines and adverts that contain pigs for sale. Dig around on this site or use Google to find a reputable site. You should always ensure that the seller has experience with pigs and will give you the necessary documents. You need a licence and to fill out a particular form whenever pigs are moved from one place to another, including bringing them to your onw small holding or land. In most cases, you can move pigs under the ‘general licence for the movement of pigs’. The licence document tells you what to do before, during and after the journey. Your pigs should be fit and healthy to travel, and they should be in a suitable housing / container for the journey. When the pigs have arrived on your land, the law says you cannot move any pigs, even those already there, for 20 days. If you already have cows, sheep or goats on your land, you must not move them anywhere for six days after your new pigs arrive. This helps prevent diseases spreading. The next thing to do is register your pigs with your Animal Health Office. You will be given an identification number called a herd mark (as pointed out above). All pigs over one year old must have identification such as a paint mark, tattoo or ear tag with your herd mark on. Remember, Pigs of any age must have an identification mark or tag if you intend to take them to a market, slaughterhouse or another smallholding. As the registered keeper of pigs you are responsible for the health of your pigs, and you should always contact your vet if you spot any sign of disease. There are a number of diseases that can affect pigs, some of which can be even be passed onto humans. You can also register with Animal Health to receive alerts about outbreaks of disease and advice on how to deal with them and we’d always recommend that just to stay in the loop. 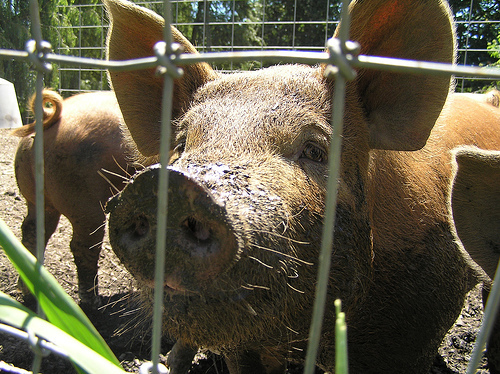 regulations as pigs kept in a commercial herd, and they must be legally identified. As a pet pig owner you must never move your pig(s) or walk them without obtaining a walking licence from your local AHVLA Regional Office. route it will not be approved. pig farms or fast food outlets, etc. If it is approved, you are issued with a licence that needs to be renewed annually. The licence must be carried with you during the walk. If you have any questions about keeping pigs please leave a comment below or contact us via the contact form.